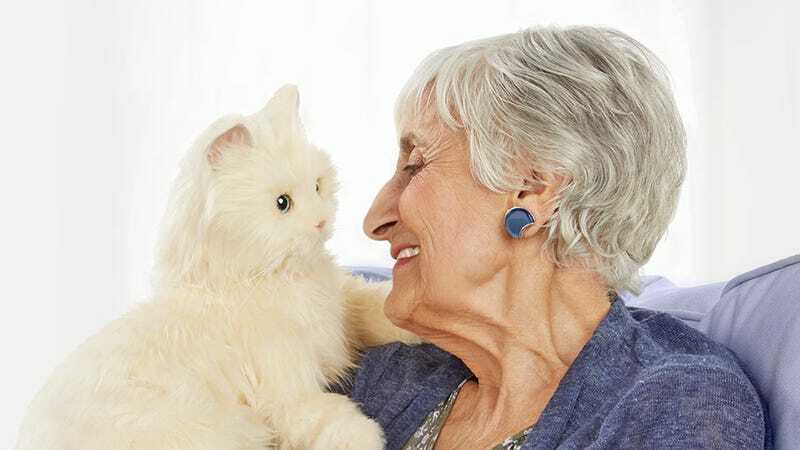 After already conquering demographics including kids, teenagers, and those technically considred adults, Hasbro is reaching out to that last frontier of consumers: seniors, with a new toy line featuring lifelike robotic companion pets that only need affection, not feeding or bathroom breaks. The company’s new Joy For All line might sound a little depressing, almost like a robotic substitute for visiting your grandparents. But you grew up with Tamagotchis, Pokemon, and other virtual pets that never needed much maintenance; why shouldn’t your aging loved ones also be able to enjoy some virtual companionship too? The first animal in the Joy For All line, the $99 Companion Pet Cat, is now available and comes packed with motion and light sensors so that it can realistically respond to being petted, held, and hugged. Hasbro hasn’t gone into too much detail about how it works, but the cat apparently has new vibration technology that allows it generate responsive purrs that both sound and feel incredibly realistic. But it doesn’t just purr. Pet the companion cat on the head and it will automatically move it towards your hand, demanding more attention—or at least appearing to. And if you continuously pet its back, eventually it will roll over so you can give it a belly rub. There’s no word on how long the cat will, well, live, on its included set of four C-sized batteries. But if left alone for a few minutes it will automatically close its eyes and fall asleep to help extend battery life for as long as possible.